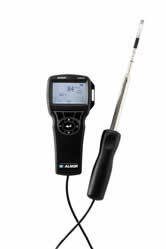 The Alnor® Velometer® Thermal Anemometer AVM440 is like having multiple meters for the price of one, yet it is very simple to operate. The AVM440 includes a straight probe–all in one compact package. Ideal applications include HVAC system performance, commissioning, plant maintenance, critical environment certification and duct traverses.